The Social Security Administration's (SSA) Windfall Elimination Provision (WEP) has been on people's mind, and with it affecting more and more people (including educators) every year, it is an important topic to cover. Back in February, I wrote a post titled - "Will You Miss Out on Social Security Benefits? - Your Retirement and the Windfall Elimination Provision." It was essentially a basic summary of what happens when you retire and try to collect SSA benefits from your account or your spouse's account when you have not been contributing to Social Security. Today's post will still focus on the WEP, but it deals more with proposed reform and our "lovely" elected members of Congress. It is something I found very interesting. I have heard from some of my financial clients and educators that they are "excited" that the "new" Congress has bills in the House and Senate to remove the WEP and Government Pension Offset (GPO) (note - they are essentially the same thing and for this article any reference to WEP is also a reference to GPO). Specifically, there is the House bill, HR 235 (H.R.235) - Social Security Fairness Act of 2009, and the Senate bill, S 484 (S.484) - Social Security Fairness Act of 2009. This sounds great until you dig a little deeper. It seems that every single year/term there are new bills to remove the WEP. I found one website, The Coalition to Preserve Retirement Security (CPRS), that had news items going back on this subject till 2004 about bills that mirror this current legislation. Take a look for yourself - Windfall Elimination Provision News and Reports. Since this has been an ongoing issue, both the Democrats (who have been in control of Congress since 2007) and the Republicans (who controlled Congress from 1995-2006) are not without blame for not confronting this issue. What really strikes me as odd is that every year bills are introduced with tremendous support, but they never get out of committee or reach the floor for a vote in either the House or Senate. For instance, the 2009 House version has 301 sponsors, and for those that do not know, there are 435 Representatives. You would think that this would be an easy bill to pass since a majority have already sponsored it, but it just sits in the House Ways & Means Committee. On the Senate side, the numbers are not quite as large, but 29 Senators have sponsored it (out of 100). I have not done the research, but I wonder how many of the 29 are up for reelection this next cycle? In any event, the bill also just sits in committee - Senate Finance - with no hope of being brought up for a committee or floor vote. Is this just a ruse? Let's look at it. All of these Representatives and Senators can come home and tell their constituents about how they care and how they have put forward a bill to help the citizens, but each one knows it has no chance to be voted on or lead to true reform. What makes it worse is that during these lean economic times, this is when most citizens are vulnerable to believing them. I looked at a number of articles about reforming WEP, and the prospects are not good. In a time of soaring deficits, a Social Security system that WILL run deficits in 30 years without reform (see SSA Trustee Annual Report), and a population that is already being beat down with health care reform and cap and trade (both proposals would lead to higher taxes and/or expenses), it is tough to try to find a way to pass these WEP reform bills that could cost up to $80 billion over 10 years. There are solutions, but each of them cost money, and right now no one wants to spend the "political capital" to reform it. Previous reports I have read said various reform proposals could cost from $5 billion to $80 billion over 10 years. Most on the low end simply alter the formula to help the very lowest incomes and those on the high end repeal the WEP altogether. The problem with just reforming the bottom is that the top will also beg and plead for reform. Years ago, before I started this blog, I had heard story after story from my wife and her colleagues about how the WEP was costing educators hundreds of dollars every month in reduced benefits. I heard about various legal ways that educators around the country tried to circumvent the system to take them outside the WEP formulas, and it all seemed a bit "over-the-top" to me. Having researched it, written about it, received e-mails asking/talking about it, and knowing my own wife will confront it, it is obviously something that will continue to be an issue. The reality is that WEP reform opens up the subject of Social Security reform (greatly needed), but rather than deal with both issues, we just push it back further and further. They could both be solved, but no one wants to be the bad guy that alters SSA benefits or full retirement age. I really wish I could point to something positive on the subject, but it looks as if the current system will remain in place - despite what our elected members of Congress say and propose. On a side note, I was asked how I decide to focus on any particular subject. Truthfully, I respond to e-mails privately, but if the subject is of a broad scope I try to use it to help others that may have similar questions/concerns. Also, I can view what searches people have used to find the blog, and the number of searches for windfall elimination provision or something similar have far exceeded other subjects. What has been a surprise to me is that since I posted the previous WEP article it has been the second most viewed article over that time period (retirement safety being the first). The bottom line being if you have questions or suggestions, please send them to me. I am always looking for a good subject to discuss and hopefully help others. E-mail me your thoughts at rschultz@rollinsfinancial.com. It is sometimes great to get out of the office to hear what other people think. Along those lines, I spent Thursday at a conference in Atlanta discussing various client issues that other advisors face. A topic that kept being brought up was that frequently people wait until just before/after a "life-changing" event to find out what they should be doing. If you have been reading this blog for any length of time, you know that I usually try to "push" you to think ahead and not get behind. From my posts on contributing to your retirement (i.e. your 403b/401k), organizing your finances, and planning your power of attorneys and will, it is about preparation before and not after something happens that allows you to avoid frequent and usually costly mistakes. We have all been late for some appointment and rushed out the door only to find out later that we left our cell phone, sunglasses, wallet, purse, checkbook, or keys behind (yes, I’ll admit I ran out one time late for work to notice that I had just locked myself out of my house... my wife laughed at me). Had I been ready 15 minutes earlier, I doubt that would have happened. Planning for the future and the unknown is somewhat the same. I find it interesting that I hear clients and neighbors plan for six months or more for some fabulous vacation, but if you ask them about how they are doing with their retirement plan, they look at you as if you are speaking a foreign language. Which is more important – the week of vacation at the beach now or the 30 years of “vacation” we all want? Take a moment to review your personal finances and plans. Talk to your family (parents, children, etc.) about what things they have planned. Please, do not force the issue with your family, but make them aware that you care about them and their future. You just want to know that they have moved in the right direction and made some plans and decisions. All of this brings us to my little conference on Thursday. After hearing person after person talk about the various issues, I want to help all of you avoid the same mistakes. If you would like for me to help review your personal finances or those of a family member or friend, I am offering to review them for free. Yes, free. Whether you have a 403(b), 401(k), IRA, brokerage accounts, etc., I will review it, discuss it with you (by meeting, phone, or e-mail), and essentially, let you know what I think. I cannot make it much easier than that. You simply need to tell me about you, send me the statements (by e-mail preferably or fax), and let me know how to contact you. That’s it. I have thrown it out there, so it is up to you to decide what is important. Are you going to worry about the weather for your next vacation or take a small amount of time to get a handle on that LONG, 30 YEAR vacation we tend to call retirement? You can always worry about the weather later. I hope that everyone is in the midst of a relaxing and enjoyable summer (I know my wife is). Hopefully, you have enjoyed reading the recent posts, done some thinking, and started on a plan to get organized this summer. I also want to thank everyone for the various comments that have been e-mailed to me. It is always good to hear what other people think about my posts, and if you wish, you can e-mail me at rschultz@rollinsfinancial.com. Along those lines, I wanted to share some of the recent editorials I have read regarding education. They are all worth a read, and the last is one of the more interesting ones just because it discusses a student strip search (that I cannot believe someone thought was a good idea). In any event, I welcome you to read all of them and enjoy. Learning Lessons From Private Schools - The Economist - "The right and wrong ways to get more poor youngsters into the world’s great universities." Charter Schools Win a High-Profile Convert - By Jon Keller - The Wall Street Journal - "Tom Menino, the longtime Democratic mayor of this (Boston) city, is not known for rocking the boat or for eloquence. But earlier this month he stunned many in the city when he gave a powerful speech about school reform. The speech took aim at the lack of progress in dozens of low-performing, inner-city Boston public schools, many of which have not met adequate yearly progress for five years running." Lessons for Failing Schools - The New York Times - "The $100 billion education stimulus package gives Education Secretary Arne Duncan unprecedented leverage to energize the languishing school reform effort. Mr. Duncan has said from the start that he wants the states to transform about 5,000 of the lowest-performing schools, not in a piecemeal fashion but with bold policies that have an impact right away. The argument in favor of a tightly focused effort aimed at these schools is compelling. We now know, for example, that about 12 percent of the nation’s high schools account for half the country’s dropouts generally — and almost three-quarters of minority dropouts. A plan that fixed these schools, raising high school graduation and college-going rates, would pay enormous dividends for the country as a whole." A Union Promotion - The Wall Street Journal - "Since taking over in 1998, she has done everything she could to block significant reforms to New York's public schools. Take her opposition to charter schools. She resisted raising the state cap on charters from 100 unless the union could organize them. (She lost and the cap now is 200.)" An Unreasonable Search - The New York Times - "In an important victory for students’ rights, the Supreme Court ruled, 8-to-1, Thursday that school officials acted unconstitutionally when they strip searched a 13-year-old girl. The majority was too willing to find that in this particular case the officials involved were immune from liability. But the decision still sends an important message to schools about the need to respect their students’ privacy when they conduct investigations." 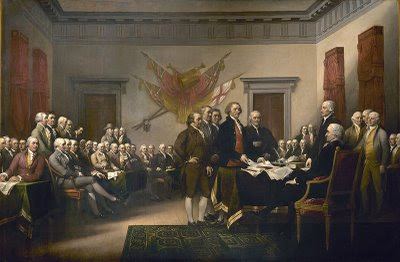 As we celebrate today with family and friends, let us not forget the trials and tribulations of our great country over the last 233 years and the men that started us on this journey. The parades, the fireworks, the cookouts, etc. are a great time, but take a moment to reflect on being an American. Making History - By Peggy Noonan - The Wall Street Journal - "Monday, July 1, was heavy and hot, and a full-scale summer storm passed through the city late in the morning. John Dickinson of Pennsylvania rose to speak. He knew he was endangering the respect in which he was broadly held, his 'popularity,' but he once again counseled caution: Slow down, separation from Britain is 'premature,' to declare independence now would be 'to brave the storm in a skiff made of paper.' When he sat down, 'all was silent except for the rain that had begun spattering against the windows.'" A Fresh Fourth - The New York Times - "It’s tempting to seek a kind of refuge in the Saturday-ness of this Fourth, to let the meaning of the holiday slip a little in the interest of a relaxing day in the backyard or at the beach. And since there is no proper ceremony for observing the Fourth — not much ritual besides a parade and some looking skyward after dusk — it’s left to each of us to decide just what to do about it." Hopefully, you have organized all of your financial matters. If you did, you now have a grasp on where everything is and how much you have... now what? We are moving on to the next step in getting your financial life in order. Today we will discuss: Durable Power of Attorney (DPOA); Medical Power of Attorney (MPOA); Living Will; and Will. Yes, this is serious today. I have been contemplating how to try to explain everything that we cover when someone comes into our office to discuss these items, and frankly, it is tough and has taken me a few days longer than I thought. Everyone is different and everyone's holdings are different. What works for one person may not work at all for someone else. Below I have given you some ideas and things to think about, but PLEASE consult with an attorney or at least someone knowledgeable in estate planning. Remember, these are some of the most important documents you will ever have, so it is best to get them done right and by a good attorney. Generally, preparing all of these documents at once can have a total cost of just a few hundred dollars, but the knowledge that it is done right removes a huge burden. Also, laws vary by state, so it is always best to have someone that really knows what they are doing in your state for each document. Durable Power of Attorney (DPOA) - A power of attorney is a document in which you state that you give someone else (usually a relative or friend) the authority to make certain decisions (generally financial) and act on your behalf. The person to whom you give these powers is called an "agent" or "attorney-in-fact." You are called the "principal." Just because the word attorney is used does not mean that the person you give authority to has to be a lawyer. Your agent is duty bound to make all decisions in your best interest. They are essentially "you" when they make decisions. Also, a durable POA allows your agent to make decisions for you after you have become incapacitated. You CANNOT make a DPOA after you have become incapacitated. You must know and understand what you are doing. A person who is mentally incapacitated is not capable of meeting these requirements. That is why it is good to get it out of the way now. Additionally, at your death any power of attorney becomes null and void. From that point forward, your estate has claim to all of your holdings, and power passes to your executor. Medical Power of Attorney (MPOA) - Much like the DPOA but this document allows the agent to make health care decisions on the principal's behalf should the principal be unable to make such decisions. By the way, an agent may make health care decisions on the principal's behalf only if the principal's attending physician certifies in writing that the principal is incompetent. The physician must file the certification in the principal's medical record. In most states, your spouse is allowed to make medical decisions for you if you are unable, BUT if your spouse is unable to make decisions for you (unreachable, incompetent, etc. ), then NO ONE is allowed to make those decisions without going to court first. Yes, that means even your parents, brother, sister, children, etc. are all powerless. Once you reach the age of majority (18 or 21), your parents' power is gone. I was at a conference discussing MPOA's, and the attorney giving the talk had his own horror story. His son (22) had an accident, was in a coma, and required medical decisions to be made. His wife and him showed up to make those decisions on behalf of their son only to find out that they were powerless. He literally had to petition the court to be allowed to make those decisions as the guardian/agent... not a father. And, this is what his specialty was. He had forgotten to take care of his own family. *** Note - Under a MPOA, to keep your spouse in charge, name your spouse as your primary agent, then start your list after them. This takes the guess work out and any squabbles. For example, I would name my wife, my sister, then my brother (rarely are all three together in the same place). This allows me the best possible chance that someone else would be available to make those decisions that actually knows me. Living Will - A living will is a legal document that a person uses to make known his or her wishes regarding life prolonging medical treatments. It can also be referred to as an advance directive, health care directive, or a physician's directive. Generally, a living will describes certain life prolonging treatments. You, the declarant, indicate which treatments you do or do not want applied to you in the event you either suffer from a terminal illness or are in a permanent vegetative state. A living will does not become effective unless you are incapacitated; until then you'll be able to say what treatments you do or don't want. They usually require a certification by your doctor and another doctor that you are either suffering from a terminal illness or permanently unconscious before they become effective as well. This means that if you suffer a heart attack, for example, but otherwise do not have any terminal illness and are not permanently unconscious, a living will does not have any effect. You would still be resuscitated, even if you had a living will indicating that you don't want life prolonging procedures. A living will is only used when your ultimate recovery is hopeless. A living will is different from the MPOA. The MPOA allows the agent to make decisions when the principal is unable to do so, but the ultimate prognosis is not terminal. The living will comes into play only when the doctors believe there is a terminal illness or permanent vegetative state. Will - Making a will is a necessary and usually fairly simple process that can save your family time, money and grief as well as give you peace of mind. A will is a legal document that sets forth your wishes regarding the distribution of your property and the care of any minor children. There are several types of wills including: Testamentary (is the traditional type of will with which most people are familiar. It is a formally prepared document that is signed in the presence of witnesses. ); Holographic (no witnesses and rarely are approved by the court); and Oral (spoken testaments given before witnesses that are not widely recognized from a legal perspective). Creating a will gives you sole discretion over the distribution of your assets. It lets you decide how your belongings, such as cars or family heirlooms, should be distributed. If you have a business or investments, your will can direct the smooth transition of those assets (for businesses it is called a succession plan). While wills generally address the bulk of your assets, there are a variety of items that are not covered by the instructions in a will. These items include community property, proceeds from life insurance policy payouts (beneficiaries are dictated within the policy), retirement assets (IRA's, 403(b)'s and 401(k)'s are directed by beneficiary designations), assets owned as joint tenants with rights of survivorship and investment accounts that are designated as "transfer on death." If you do not know who the beneficiaries are of your 401(k), 403(b), IRA, life insurance policy(ies), get that information now. Your will CANNOT change the directions already on file for those accounts and policies. For example, I could have my wife be the sole beneficiary of my IRA in my will, but if my IRA account application says my brother and sister get it... they get it not my wife. This is very important when people get married, have children, divorced, remarried, etc. I saw one person forget to change an account have his ex-spouse inherit his IRA and not his current spouse. If you do not have a will, you die "intestate." In such a case, the state will oversee the distribution of your assets. Contrary to popular opinion, the state does not inherit your assets, but rather distributes them according to a set formula. The formula often results in half of your estate going to your spouse and the other half going to your children (in Georgia a spouse can get as little as 1/3 of the assets). Such a scenario can result in the sale of the family home or other assets, negatively impacting the surviving spouse. This can create financial and emotional difficulties, particularly if your spouse was counting on the bulk of your assets to maintain his or her standard of living. Further complications can arise if your children are minors, as the court will appoint a representative to look after their interests. General Notes - Over the years, I have seen some issues develop even when all parties have the best intentions. Consult with an attorney. I cannot stress that enough. This is a pretty decent guide, but this is not the end all be all guide. Your state may be different, and you want someone that has knowledge of those differences informing you. Find a few people that you trust to be your executor (executrix), POA, and MPOA and list them in order than you want them to make decisions. Name three people for all - Primary (first choice), Contigent (second choice), and Tertiary (third choice). Sometimes the best executor is a non-family member while the best POA and MPOA is a family member. Co-executors sounds nice, but it can cause issues. If one executor wishes to sell a property and the other does not, they must come to an agreement or the court must get involved. Property could be as small as jewelry or as large as a building. If there is a dispute, the court will try to get the co-executors to reach a financial agreement amongst themselves. If they cannot, then the court must get involved. Have a talk with your agents/executors. You can schedule a meeting, make a phone call, or just have a chat, but let them know what you are thinking and where your papers are. Safety deposit boxes are generally NOT a good place to have your original POA, MPOA, Living Will, or Will. The bank will want to have an original before they allow your agent to the box, thus a court order would be needed. Have a copy with your lawyer, financial advisor, and/or accountant. These copies should contain a letter/note stating where the original is held. Conclusion - Ultimately, what you are trying to do is make it so you have some control over items when you have no decision making capacity. You are trying to take the courts and family squabbles out of the equation and streamline the process to handle each situation. These are big decisions but ones that should help lift a burden for you when you are finished. Finally, remember that a little preparation now will save time, money, and most importantly heartache for those you hold most dear at a stressful time. My advice is to do everything you can to lessen that stress as much as possible.